At a time of rampant apathy among critics of pop music, the last year must seem like a classic case of cognitive dissonance. Since last fall, pop musicians have produced such high level offerings that their performances offer a riposte to those critics who say that pop music is in inexorable decline and no longer worthy of scrutiny. Just a few of the delightful CDs released in the last year include Billy Bragg and Wilcos Mermaid Avenue Vol. 2, Robert Crays Take Your Shoes Off, Stacey Earles Dancin with Them That Brung Me, Steve Earles Transcendental Blues, Steve Forberts Evergreen Boy, Los Lobos This Time, Shelby Lynnes I Am Shelby Lynne, Aimee Manns Bachelor No. 2, Randy Newmans Bad Love, Richard Thompsons Mock Tudor, Tom Waits Mule Variations and Neil Youngs Silver & Gold. Even former Rolling Stone critic Parke Puterbaugh, who sees the rock end of the pop world in a state of ruins, admits that if you look hard enough, you will find gems aplenty. Accordingly, the resourcefulness and open-mindedness of the consumer must reign. I turn away the fairest flower of love"Carter and Grammer, who played a pass-the-hat house concert Sunday night in Indianapolis and will be performing in Chicago each of the next two weekends, draw a mythical picture of lifes ecstasies and miseries. The lyricism is accompanied by a Crowded House-like harmony that keeps listeners tapping their toes throughout a Dave and Tracy concert. "Caroline puts Dylan on, she always sings along/ She gets the words all wrong, she falls out of time." "This woman would come over uninvited, and Id let her in," Carter said of the real Caroline. "Wed have these intense, late-night conversations, wherein shed project all this saint-like stuff onto me. I thought she was interesting and in many ways likable, but she struck me as really unbalanced. The thing is, though, late a night, after spending hours talking to someone whos fairly nutty, you begin to question your own sense of balance. After a while, all your notions about human interaction begin to seem illusory." "Walkin Away from Caroline" stands as a paradigm for Carter and Grammer songs. It describes a troubling state of affairs and a narrator who thinks he or she has this neutral, observational feel for things. Yet upon reflection the narrator realizes that something beyond the surface meaning is going on. In this case the narrators judgment of the nutty woman causes him to rethink his own hold on reality, his own perception of relationships. This haunting song reinforces one of the central themes of the title track, "Tanglewood Tree." This time, though, the narrators love "lifts her wings and the music is gone." Highly metaphorical, "Tanglewood Tree" has the power and intensity of first-rate poetry. "Love, in my experience, begins beautifully but very often turns complicated and constricting," Carter continued "Its like a beautiful garden that usually grows completely out of control, and pretty soon your pleasant walk in the grove turns into a nightmare of clinging vines and poison nettles. Love begins in roses but often ends in thorns. Thats what the songs about. And I just loved the sound of the words tanglewood tree. I thought maybe the Everly Brothers, in some fantasy time and place, might be doing a song that went love is a tanglewood tree, so I just wrote what I thought that song might sound like. Of course, I took it too far to have it still sound that much like an Everly Brothers outing, but hopefully some of the same essence remains." Meanwhile, "Hey, Conductor" and "Farewell to Fiddlers Rim" also deserve a listen. The colorful "Hey, Conductor" follows the rhythm of a train. It is, says Carter, "our only happy song." Meanwhile, "Farewell" features Grammers dazzling fiddling. Another delight is the up-tempo "Crocodile Man," which Carter calls the duos contribution to the long history of country ditties about alligators. Its a tune about how a mother knows when her child has strayed too far. "Every now and then we try a blues song and Crocodile Man started out as a blues song, but somewhere along the way it became more of a country song," Carter said. Carter calls "Farewell to Saint Delores" his favorite on this second CD. It has an elegiac, Emily Dickinson, Miss Havisham feel and is another song about separation. One of the CDs sleeper hits is "The Mountain," which features Grammers measured singing. It starts "I was born in a forked-tongue story" and proceeds to describe a lonely Promethean character. Carter plays around with the divergent impulses in his life. He has spent time in academia, and hes also toured the country playing guitar and piano. His father is an mathematician engineer and his late mother was a teacher and charismatic Christian. "My whole life has been a process of reconciling these divergent influences," Carter said. "I come from an old Texas family. My dad worked for the Navy in Oxnard, Calif., and thats where I was born. Three weeks later we moved back to Texas. Later we moved to Tulsa and thats where I went to high school. I attended the University of Oklahoma, where I got degrees in music and fine arts, and took a lot of English and French. Then I went to Portland and got a degree in math from Portland State University. After that I attended the Institute of Transpersonal Psychology in Palo Alto and California Institute of Integral Studies in San Francisco. At those schools I studied the psychology of mystical experience. "My father is a retired petroleum engineer. Hes kind of famous for it. He introduced higher mathematics into the science of petroleum engineering. He really is a fine mathematician in his own particular area of study. My mother, recently passed away, taught physical sciences at the University of Tulsa and in the Tulsa public schools. She developed an interest in evangelism later in life. She had begun to give workshops on healing by the Holy Spirit." Grammer was born on the opposite coast, in Homestead, Fla., but she was raised in Southern California. "The first musician to have any kind of influence on me was my father," she said. "He played electric and steel guitar, and we would sit together nightly, sometimes with kids from the neighborhood, singing whatever my dad had songbooks forWillie Nelson, Neil Diamond, old country classics. I learned harmony by singing with top 40 country and pop radio. Around our house, you would hear a varietyanything from Willie & Merles Pancho & Lefty to BJ Thomas Mighty Clouds of Joy to Queens Bohemian Rhapsody. " She also studied classical violina favorite piece is Bachs Brandenburg Concertosand she attended the University of California at Berkeley. However, she didnt study music there; instead, she studied English and anthropology. "It never occurred to me to study music at Berkeley," Grammer said. "I have always loved to write, and have always been fascinated by monkeys and fossils. I thought I would be a teacher or an archaeologist or a primate caretaker-trainer after graduating from college. Encouraged by friends, I tried some music courses at Cal. But my approach to music has always been intuitive, physical and emotional rather than analytical. Its probably terrible to admit this, but at the time the formal study of music left me totally cold. I only wanted to play. "Cal has some of the most highly-respected English and anthro professors in the world. Through a combination of studies I unearthed a love for Native American literatures. Daves songs are full of Native American imagery and the very first time I heard him play, I felt an instant connection, like he might be the place where all of the things I truly lovedlanguage, anthropology, and musicwould finally come together." Perhaps this background in language partially explains Grammers love of the fiddle. "The violin is full of moods and tones, sass and sorrow," Grammer said. "Its a versatile instrument, great for textures and leads and great when an artist wants to blend styles and has limited instrumentation. With just violin and guitar, you can fit into a lot of genres. "The growing popularity of Americana, folk and roots music, and a general shift toward a more honest, stripped-down, organic sound may have helped bring fiddlers back into the spotlight. All my life people have asked me to play Hoe Downthis simplified version of Orange Blossom Special I learned in elementary school. I was never that great at it. I think they like the speed, the sound of multiple strings being played at once and the energy. They also know the tune and this leads me to believe that we love fiddling for some of the same reasons we love Shakespeare and still go to see his plays: there is a sense of the familiar, but expectation for a new interpretation. Who will be cast? How will the lines be spoken? Where will the changes be, and how will we be surprised? What will the player bring to the work that has not been done before?" A consummate raconteur, Carter also has plenty of formal musical training. "Ive played the guitar for many years," he said, "and I used to play the piano at a pretty high level. I made my living as a pianist for a couple of years. I also play banjo and dulcimer, and I can carry a tune on cello and mandolin I started off as a folk singer, listened to country, got into the blues and then rock n roll. I studied classical piano and composition in college, graduated and worked at learning jazz. I got deep into programming aleatoric music algorithms on my computer. Then I went back to being a folk singer. "My first hero of songwriting was Joni Mitchell. Im very interested in pop psychedelia. I love the Beatles Rubber Soul through Magical Mystery Tour period, and I love the second Dukes of Stratosphere albumand also the country psychedelia of Lee Hazelwood and a lot of the stuff he did with Nancy Sinatra. I also like Leonard Cohen, Emmylou Harris, Sean Colvin, Buck Owens, Miles Davis, Dwight Yokum, Steve Earle, Townes Van Zandt, Guy Clark, Duke Ellington, George Gershwin and Waylon Jennings. Also the songwriting and cataloging of Robert Burns. Some poets I love are e.e. cummings, William Blake, Robert Duncan and Wallace Stevens." Cormac MecCarthy is a favorite novelist. 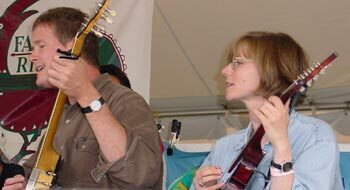 Carter and Grammer met four years ago, won a few folk music contests and began recording together in 1998. Their first CD, "When I Go," was made in Grammers kitchen. They sent it around to various DJs and it got written up in the Los Angeles Times. It was the ninth most played folk CD of that year. The duo won a prize at the Kerrville, Texas, New Folk Festival, which is where Michelle Shocked launched her career "Pretty soon we were getting airplay all over the country," Carter recalled. "Andrew Calhoun (a truly superb songwriter in his own right) of Waterbug Records liked our CD and started sending it out to people all over the world. This resulted in even more airplay. We got an official showcase at the National Folk Alliance conference (in Albuquerque." In addition to its West Coast fan base, the group has a following in Great Britain. Portlands active musical scene is fertile soil for producing such talent as this duo. "Theres a musician on every corner, at every bus stop, behind every espresso machine or Kinkos counter and probably half the executive desks downtown" Grammer noted. "Its a great scene, lots of variety, open-minded listeners. A little heavy on punk derivatives for my taste, but the acoustic scene is picking up steam. "We met at the Buffalo Gap in Portland in February 1996. I heard Dave play two songs toward the end of a Portland Songwriters Association showcase. I tell you, its like the entire room disappeared. I was deeply moved and instantly drawn in but far too shy to do anything more than recognize the power of Daves music and hope that some day I could play with someone like him. Thanks to luck and timing, we met on the way out the door. I was carrying my violin, having played with another songwriter earlier in the evening We were introduced, he noticed my instrument, and invited me to play with his band sometime. Itll never happen, I thought to myself. Sure, I said. But he really did call, and I really did go to that first practice, and weve been playing together ever since." The late Allan Bloom, who taught at the University of Chicago, said "Music is the medium of the human soul in its most ecstatic condition of wonder and terror." Blooms statement informs Carters often dark music. Wonder and terror fill the worlds of Carters characters. Indeed, hearing Carter and Grammers music is a bit like reading literature of the grotesque. Carter, who says hes opened to about any philosophy, has an ear for the American eccentric. Theres a little of Sherwood Anderson, Flannery OConnor and McCarthy in his song writing. Carter says both the lyrics and music often come to him in his sleep. "I hear music and lyrics in my dreams a lot of times, and I get up and write them down," he said. "I pay a lot of attention to my dreams, and whenever I can, I try to keep myself in a creative, daydreamy sort of state. Im interested in shamanic work and meditation, and I think its beneficial for an artist to walk with one foot in the waking world and one foot in the dream world." Carter said the duo is working on another CD, tentatively titled "Drum Hat Buddha" with a release date of next July. The two are already floating some of the songs on that CD on a trial basis on their current tour. Each is also recording a solo CD. "Well play and co-produce on each others recordings," Carter said, "but we each want to do pet projects that dont exactly sound like Dave-and-Tracy stuff. These will also be available next summer, but there wont be much of a big national airplay-and-marketing push with these. Well mostly sell them at our shows and online." They also host a monthly songwriter event in Portland that showcases national, regional and local performers, and they are now selling a songbook with the scores and lyrics of their compositions.